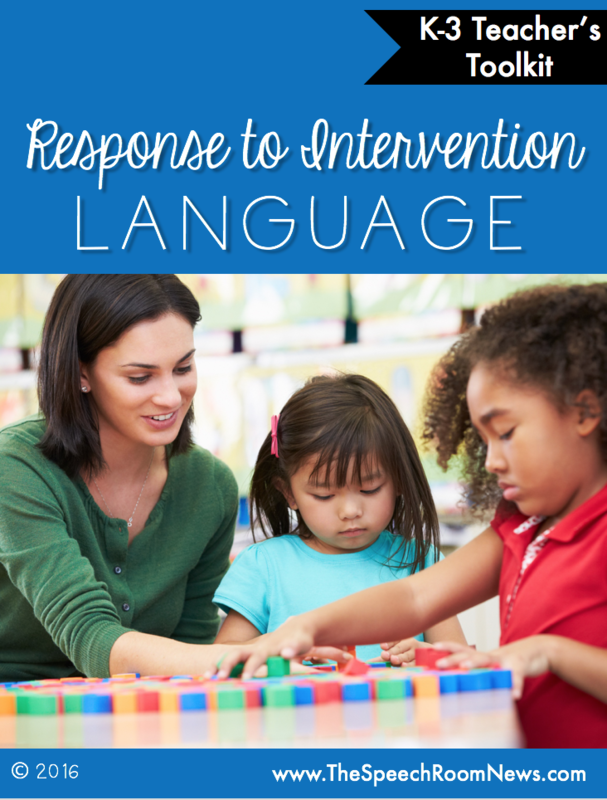 Response to Intervention: Three little words that mean so very much. RtI is a regular education initiative. It is meant for all students. RtI is not special education. My RtI packets are developed to be utilized by classroom teachers. 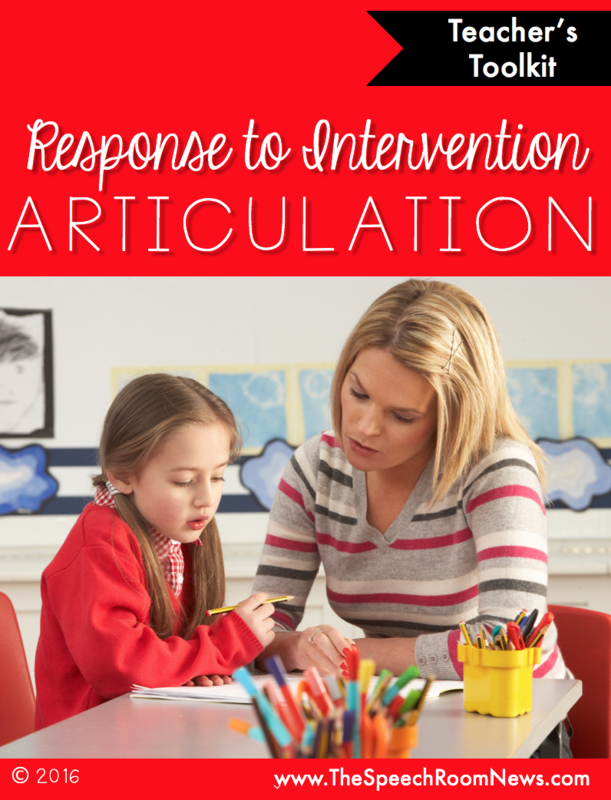 Students with communication impairments, much like other academic content areas, require Response to Intervention services provided by the classroom teacher. Most children will naturally learn to use expressive and receptive language. This is Tier I of the RtI triangle. Tier II is the 20% of students who need additional instruction. Teachers can implement language instruction in Tier II supports in the classroom or small group. This packet focuses on helping you identify and design supports for Tier II. Through progress monitoring and evidence-based instruction, you can determine if the interventions are successful. Successful documentation of Tier II interventions is how we identify which students need more intensive (Tier III) support through a speech-language pathologist. To qualify for special education services, students must demonstrate two things. First, educational impact (checklists included to document academic including specific common core standards). Second, lack of response to interventions or ongoing need for significant interventions. This packet helps you prove both with data. If you take a concern to your special education team and have data to prove a student isn’t progressing with your help, you have documented the need for specialized instruction from a speech-language pathologist. This packet is 30 pages in length giving you a lot of support to develop a program for RtI. You’ll get everything you need to support RtI. Once you use these forms, you’ll add your own activities for your student to practice each week. Then help your student track the data on the included forms. Students with communication impairments, much like other academic content areas, require Response to Intervention services provided by the classroom teacher. This packet will provide you with a basic system for screening your student, identifying areas of delay, providing you with a series of intervention strategies to choose from, and progress monitoring forms. Please always consult with your school speech-language pathologist before you begin the RtI process with a student. Keep in mind that every school has a different RtI process, and you might need to combine these forms with required forms in your district. Response to Intervention (RTI) is a multi-tier educational approach aimed at early identification and support of students whose learning needs are not being met. It involves “the practice of providing high-quality instruction and interventions matched to student need, monitoring progress frequently to make decisions about changes in instruction or goals, and applying child response data to important educating decisions.” (Batsche et al., 2005) RtI is a regular education initiative. It is meant for all students. RtI is not special education. Download this my store now. I’ve also created a packet for Articulation. You don’t have to know anything about speech therapy to do interventions with your student with this binder. I’m going to lead you, step by step, with teacher scripts and student worksheets, through an RtI program for your student. To qualify for special education services, students must demonstrate two things. First, educational impact (checklists included to document academic and social impact). Second, lack of response to interventions or ongoing need for significant interventions. This packet helps you prove both with data. If you take a concern to your special education team and have data to prove a student isn’t progressing with your help, you have documented the need for specialized instruction from a speech-language pathologist. This packet is 65 pages in length giving you a lot of support. The best part is, even if you don’t have time to read and develop an RtI program for your student, you can download and immediately start using the Sound Eliciting Teacher Scripts. They tell you exactly what to say to your student to help him/her say each sound. To learn more about the RtI Artic kit and watch a periscope, click here. Purchase this Teacher Toolkit in my shop.